Wow, can the 3.3V RPi tolerate the 5V TTL levels of the Arduino? Hmm from http://elinux.org/RPi_Low-level_peripherals “The pins use a 3V3 logic level and are not tolerant of 5V levels, such as you might find on a 5V powered Arduino.”. “Non tolerant” doesn’t mean it will blow up right away, just shorten the Pi’s life span. Use a logic level converter like http://www.adafruit.com/products/395 to supply the right voltage levels. Many N-Channel Enhancement Mode MOSFETs can also be used for level shifting, some of them costing only the loose change in your back trouser pocket. It might work only because the example doesn’t send any information from the Arduino back to the Pi and thus putting 5v on the Pi input pin. First of all thank you for sharing this code! I am new in this, and i would like to know how can the arduino send back the data received to the raspberry. I’m still searching for a way to work this out. The arduino spi lib itself supports only master mode. read an SPI ADC (e.g. ADS1100). Additionally this would be more save for the hardware, because this ADC works on 2.7 to 5.5V. Where to find more documentation and/or examples using this kernel-driver ? Thank you! im beginner doing spi interface. i tried with above code to start learning. i connected wires as described but i got o/p “can’t able open device”. one thing which is different from above of mine is the broadcom pheripheral mine is BCM2835. is there any change in the code for my bcm. and one more thing spi may be blacklisted when i google for solution how to unlock them. and not able to find spidev under dev. how to resolve it? You can observe the blacklisting or not of the spi drivers by following the guide above. Specifically, the lsmod section. Don’t think of blacklisting a driver as locking but rather as a convenience mechanism for specifying that a driver not be loaded when the distribution starts up for one reason or another. Try prepending the command you are running with sudo. For example if you are running the command ‘ls’ try ‘sudo ls’. had u wrote code for receiving data from arduino? how did u get spi enabled? when i am trying to install spi_bcm2708 i am getting “unable locate package spi_bcm2708″… please guide me..
Arduino example spi receiver code is included in The above tutorial. 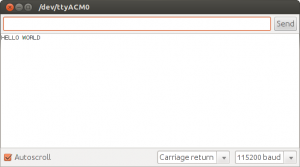 1. while transmitting a buffer why its necessary to add 0x0A at the end of the buffer (arduino) when i look at serial monitor it shows 0xAA,0xAB,0xAC “0x0A” 0xAA,0xAB,0xAC if 0x0A is added it sendinding as 0xAA,0x0A,0xAB,0x0A. 2.while receiving in rpi, each received byte in sent buffer follwed by command byte(0xFE) for 9 times. eg: if im receiving in rpi as 0xAA 0xFE 0xFE 0xFE 0xFE 0xFE 0xFE 0xFE 0xFE 0xFE 0xAB……. sorry in 1. if 0x0A is not added it sending as 0xAA,0x0A,0xAB,0x0A. I am pretty new to pro­gram­ming. 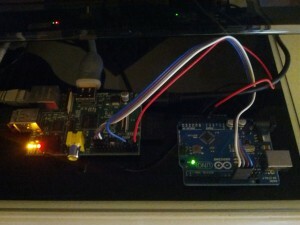 I have a device which I want to con­nect to the RPi using SPI. I tried out the spi_devtest.c and it works. But the SPI frame of the slave device requires 24 bits. I have searched high and low and have not been able to find a solu­tion. I tried chang­ing the num­ber of bits per word but that does not work. I won­der if I would have to just send 3 bytes instead of 24 bits. In that case, I don’t know how to send 3 bytes with­out the chip select going inac­tive after each word. Any help would be greatly appreciated. TT or anyone. I have the same issue of requiring 24 bits without raising syncb. Do tell how you “figured it out”. Wondering if I can use a different gpio bit and create and control my own sincb, but this seems ugly. Sorry for taking so long to respond, I ended up just sending 3 8bit words. I don’t know if there’s any other way to do it, or if there exists a better way. why the byte being returned back to rpi which sent to arduino? is any voltage converter required? I have some errors while compiling the RasPi code.. I got the /dev/spidev0.0 and spidev0.1. The RasPi is updated and everything is ok, except the “pi@raspberrypi ~/spi $ ls -al /lib/modules/`uname -r`/kernel/drivers/spi/” part, where I only get: “total 64”. 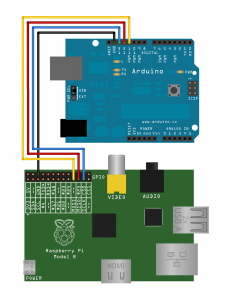 Great tuto, just may be asking a stupid question but there is no wire with CE0 ou CE1 between the Arduino and the PI, does the arduino hardware SPI work even if the Chip Enable pin is floating ? this shows great potential for fast raspi to arduino transfers! what is the fastest this can work? when i am running this code i am getting output as “cant open device” in the raspberry pi terminal.. please help me..
I’m looking to do this exact some thing (use SPI between a Pi and an Arduino). But something might’ve happened to this post. The Arduino code seems to have gone missing from this post. If someone could repost this, I’d appreciate it. Pull the SS input (Arduino Pin 10) input down to ground by some jumper. How did you get to the conclusion? What happens if you don’t? The transfer does not work. May be you have luck sometimes and the input is floating to ground. Better than pulling SS to ground is using one extra level shifter from Pi pins CS0 or CS1. Level shifter for other pins are includes on AlaMode Board. Thank you so much for being the only in depth article online! I’ve follow this article to the T.
I’t works great, the SS held high triggers the Arduino’s interrupt but there is a problem with the data. The data is only ever 0x0, my stomach is telling me its an issue with the Pi. Any idea what the issue could be? Bad sync? Not transmitting data correctly? please, if you don’t have anything else available, at least introduce series resistors. This limits the current when accidentally “Out LOW” meets “Out HIGH” or Out5V meets In3.3V. Current on input shall not exceed 1mA. Makes 5kOhms. OK, 4,7kOhm. Works, if no real fast signals or Pull up/downs or bad EMI-noisy environments are involved. The bus transceiver does a 3,3V job in both directions. So the 5V device has to cope with a HIGH signal of 3.3V. (We can not run on 5V till end of days, so I sighed and bougt a due and a raspi, no conversion problem; still this is seemingly a contradiction, both beeing 32bit bla… but I want to program Arduino from Mathematica / Wolfram. where they explain how arduino is controlled via serial, but also gets a new c++ program uploaded when the changes in wolfram demand it. Still don’t know if DUE is supportet. Maybe not yet. (Matlab/Simulink have this in their classroom licence for schools, it is part of their product named “coder”. Supporting coding for Raspi, Arduino, Lego Mindstorms EV3. It uploads code, afterwards target system runs the program, if wanted, autonomously or with communication. I am trying to establish a connection between both arduino and raspberry, but i only get garbage. 1) Where is the Slave Select pin? 2) Can I turn the Arduino using only the SPI? 3) How to I set the comunication speed on arduino? 4) Why do I only get garbage? Guys can you give an example for python? how to install the mentioned drivers and modules?